Normally, the Llano River is a dry rockbed that drains the semi-arid scrub of the western Texas Hill Country. 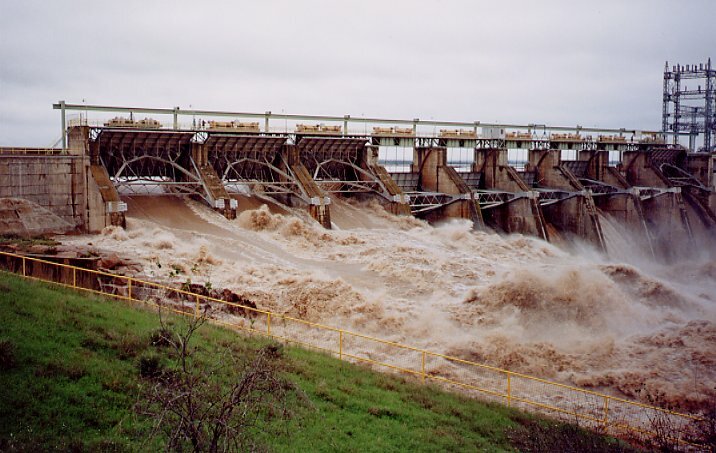 But on November 3, 2000, heavy rains hit the Llano River watershed. At Junction, Texas, about 125 miles west of Austin, the Llano River rose to 34.8 feet. This is well below the record water of height of 43.3 feet recorded in June 1935, but well above the flood stage of 16 feet. This surge of water flowed eastward and was augmented by water from Mason and Llano counties to the east, which were also hit by heavy rains. The result: a major river flood. This flood was actually a godsend for drought-stricken central Texas. 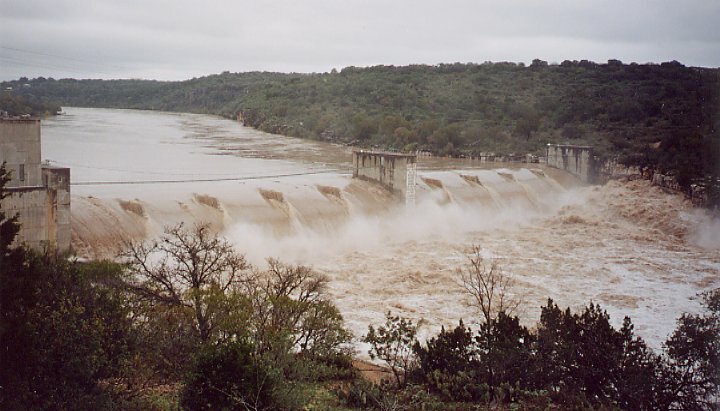 The highland lakes reserviors were at about 50% of capacity before the flood, and both Lake Travis and Lake Buchanan were filled above their November average levels. Lake Buchanan was filled by flooding on the San Saba River. 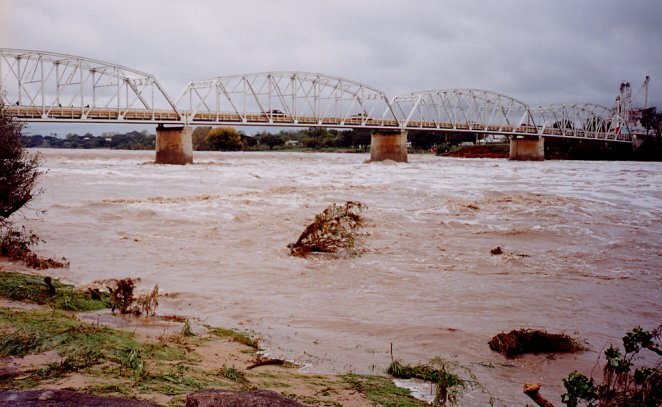 On November 15, 2001, a similar flood event occured in the Llano watershed, although somewhat smaller than the 2000 event. I drove to Llano to check out the flood, but at 3:30 PM on November 15, the surge of water had not yet reached Llano so there was a minimal flow on the river. However, within hours the water was rising and overnight the river crested at about 25 feet. Of course, there was no way to photograph the flooding at night. The Colorado River is actually a series of seven dams in the 75 miles northwest of Austin. 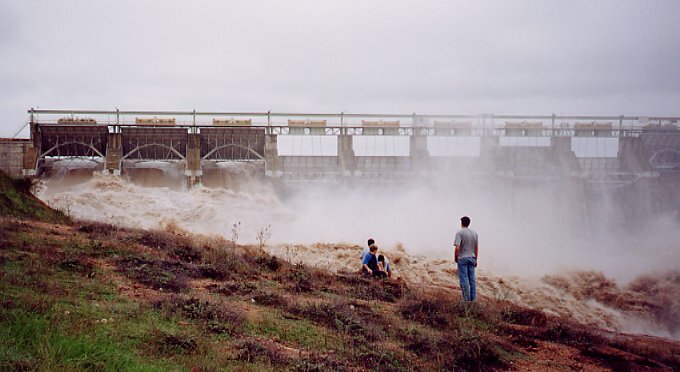 The dams affected by this flood were Wirtz Dam, which impounds Lake LBJ, and Starcke Dam, which impounds Lake Marble Falls. Both these lakes are "pass-through" lakes, with no flood pool. In contrast, Lake Travis has a large flood pool and easily soaked up the flood waters, especially since it was at about 50% of capacity before the flood. The Llano River is a dry rockbed 99% of the time, but not on November 4, 2000. When this photo was taken, the river was receding and was about 5 feet below its peak. Photo taken at approximately 1 PM, November 4, 2000. The water from the Llano River flowed into Lake LBJ, which has a minimal flood pool. Four of eight flood gates were opened. Three of the open flood gates are visible in this view. Photo taken at approximately 12 PM, November 4, 2000. Another view of the raging torrent. Interested onlookers could get right next to the outflow. Photo taken at approximately 12 PM, November 4, 2000. Water surges over Starcke Dam, which impounds Lake Marble Falls. All floodgates were open. Photo taken at approximately 11:30 AM, November 4, 2000.